Saint Petersburg, Russia: In southern France, more than 20 billion dollars are being spent on trying to make a first-of-its-kind nuclear reactor, a special steel cauldron where top scientists from countries including India hope to generate clean nuclear energy by fusing atoms, a process similar to what happens on the sun. This is till date world's largest scientific project ever to be undertaken. The reactor will weigh about 23, 000 tons - as much as three Eiffel Towers. Some 80, 000 kilometres of special super conducting wires will be used. The International Thermonuclear Experimental Reactor (ITER) brings together India, China, South Korea, USA, Japan, Russia and the European Union as scientists see if they can jointly harness the power of the Sun by literally confining it in a steel bottle. The head of ITER, Dr. Osamu Motojima, points out that together these entities "represent half the world's population and account for two-third of the global economic might." Nuclear plants today generate power by splitting the atoms and in doing so they produce large quantities of radioactive waste that can be dangerous for hundreds of years and has to be handled with extreme care. In contrast, 'fusion energy' generates power by joining two atoms into one; the usual raw material is hydrogen; and the waste generated will largely be either helium, a benign noble gas, or water. That's why fusion energy is sometimes referred to as 'evergreen atomic energy'. According to Dr. Ravi Grover, head of the Indian delegation at ITER, 'fusion is inherently safe, there is no danger of an uncontrolled chain reaction and fears of a nuclear explosion are negligible, producing almost no long lived radioactive waste'. Within the massive steel frame, gas will be heated to over 150 million degrees and it will be confined to a limited space. Using giant magnets, some atoms will then be forced to fuse together releasing huge amounts of heat which can then be directed to run turbines to generate electricity. In the first instance, it is hoped the fusion reactor will produce ten times more energy than what is used to initiate the reaction estimated to produce the equivalent of 500 MW of power. For half a century, scientists have dreamt about accomplishing this feat, but it was only in 2006 when progress was made with the formation of the ITER. Earlier this month, 800 top scientists from more than 35 countries gathered to take stock of fusion energy at the International Conference on Thermonuclear Fusion Energy in the picturesque town of Saint Petersburg, Russia. The mood was generally upbeat but there are worries that cost and time over-runs could spiral out of control in this mammoth exercise. Motojima admits there have been 'delays' and hopes that by next year, his team will be able to give a firm timeline for the completion of the ITER project. 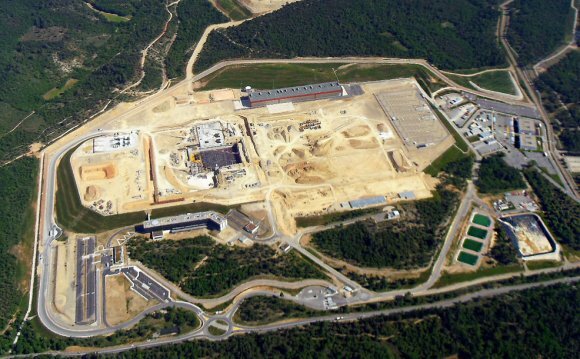 India is providing a tenth of the components for the massive nuclear complex unfolding at Cadarache in France. New Delhi is contributing what would, when completed in 2021, be the world's largest refrigerator. The cryostat acts like a thermos flask but operates at some of the coldest temperatures ever seen in the universe, working at minus 269 degrees Celsius. This is used to keep the special super conducting magnets at the cold temperature at which they need to operate; the entire fusion system would collapse if it can't be kept cold. India is also expected to contribute about 9, 000 cores over the next decade to the project, thus paying for a little under 10% of the total cost. Ratan K. Sinha, Chairman of the Atomic Energy Commission, Mumbai says 'participation of India in the ITER project, with its immense scientific talent and industrial competence, has provided an opportunity to India to master cutting edge technologies. Once the proof is established that mankind can harness the power of the Sun, India could well build its own fusion reactors after 2050. NDTV attended the 25th International Conference on Thermonuclear Fusion Energy organized by the International Atomic Energy Agency (IAEA) Vienna as a guest of the Rosatom State Corporation, Russia.